MATANGI / MAYA / M.I.A is set to release on September 28 in the United States. After receiving rave reviews at both Sundance and Berlin film festivals, M.I.A. 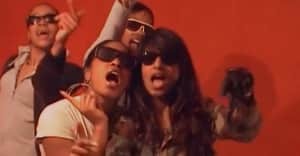 's documentary MATANGI / MAYA / M.I.A, which follows the life of the Sri Lankan-born, English raised pop-star, now has an official release date. The Steve Loveridge-directed film is set to drop on September 21 in the United Kingdom, and September 28 in the United States. With some of the film captured by reactionary footage shot by M.I.A. herself, the documentary not only chronicles M.I.A. 's rise to fame, but also controversial moments in the musician's early life, including being sued by the NFL. M.I.A. spoke with Deadline about the film in January, saying, "I think it’s nice that he [Loveridge] managed to filter it down to the essence of what needed to be discussed. Because in my own head, there’s a million other things that I would have wanted to discuss."